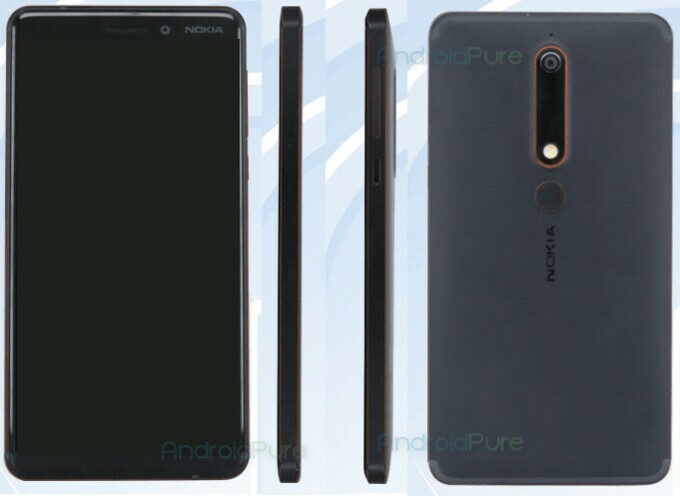 Nokia 6 (2018) is a sequel to the Nokia 6 mid-range phone released on January 2017. A few days ago, some details about the mid-ranger have leaked through the chinese regualtory authority, TENAA. Along with spec sheet, the pictures of thr sequel of Nokia 6 have leaked. Now a different spec sheet with the same model number TA-1054 appears on TENAA website. So it seems that the Nokia 6 (2018) will come in multiple models with different specs. The new specifications leaked are 5.5 inch FullHD Display in 16:9 aspect ratio, 2.2 Ghz Octa core chipset, 4GB Ram, 32 GB or 64GB expandable storage. The next mid-ranger from HMD Global may boast 16MP Rear Camera and 8MP front Camera. The smartphone will be powered by 3,000 mAh battery, according to the TENAA listing. The first listing of Nokia 6 (2016) shows the same specs of the current listing except differs in Display aspect ratio. The first model sports modern 18:9 display while the latest one sticks to conventional 16:9 ratio. The Nokia 6 sequel will come with Android 7.1.1 Nougat out of the box and may receive Android 8.1 update in no time. Recently, HMD announces that Nokia 2 will receive Android 8.1 update. According to the leaked specs, most likely Snapdragon 630 chipset will power the Nokia 6 (2018). Previously, the original Nokia 6 was powered by Snapdragon 430 chipset. When will Nokia 6 (2018) come out ? The original Nokia 6 aka Nokia 6 (2017) was announced on 7th January, 2017 at CES 2017. So the successor of Nokia 6 might be announced at CES 2018. More details about the launch date, price and availability will be revealed in coming days.